Plaque of hard-paste porcelain painted with enamels and gilded, with a portrait of Empress Maria Theresa of Austria in relief against a purple background hung with red curtains. Set in a rococo frame of flowers in colours and gilt. 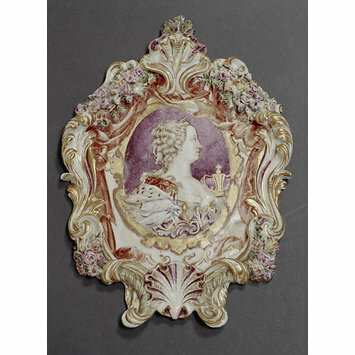 Plaque of hard-paste porcelain with a portrait of Empress Maria Theresa of Austria, Doccia porcelain factory, Doccia, ca. 1744-1746. The plaque is composed of a central medallion and a frame which were modelled separately and assembled before firing. It has elements in bas-relief and is painted in colours and gold. The central medallion has a portrait of the Empress Maria Theresa of Austria, in profile surrounded by red drapery painted inside of a frame with festoons of flowers, volutes and shells in relief. The plaque was made under the supervision of the head modeler, Gaspero Bruschi, who was active at Doccia starting in 1737. 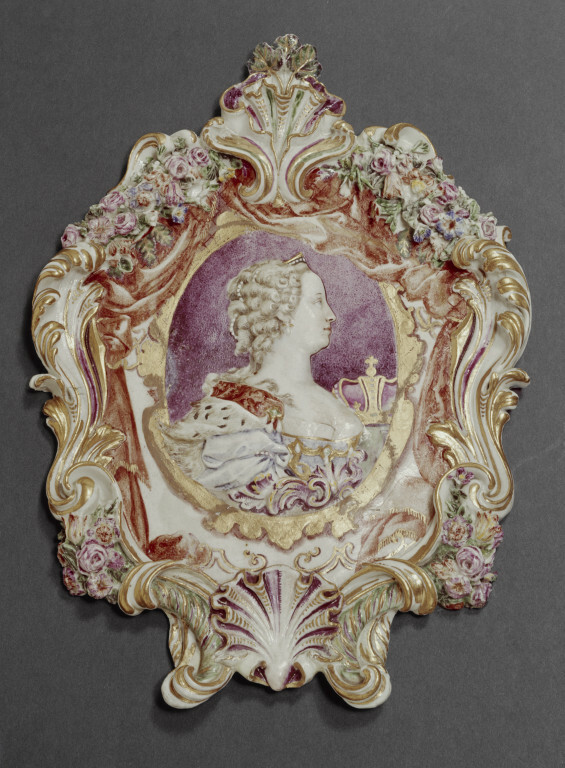 The exact model on which the plaquette is based has not been identified but it might be a portrait of the imperial couple with Maria Theresa in the foreground. At Doccia they made two versions of this portrait: one with just the figure of Maria Theresa of Austria and another with the imperial couple, probably in occasion of the coronation of Maria Theresa as Queen of Bohemia in 1743, as demonstrated by the many medallions made in her honour (JOHNSON 1990, vol. II, p. 436, 660, fig. 302, 520). Among these there is one identified by Andreina d’Agliano that was made by Mattheus Donner, (D’AGLIANO 2008, p. 99) which, although it is very similar, has several differences, like the ermine mantle, which are very unlikely to have been modified at Doccia. The first written record of a portrait of the empress which was offered as a gift by Marquis Carlo Ginori, is found in a letter dated August 22nd 1744 which was sent by the Venetian merchant Marco Zuanda to Ginori: “…to my great satisfaction I have learned that the famous portrait of the Queen has arrived safely and that you were pleased with it” (D’AGLIANO 2008, p. 99; BIANCALANA 2009, p. 113). Carlo Ginori was a very ingenious man as well as an excellent promoter of his factory, and the gift of the portrait of Maria Theresa after the coronation of the empress in 1743, paid homage to the empress and at the same time served the purpose of making the Ginori factory known in Northern Europe. Another example of Ginori’s ability in promoting the factory was the Pietà sculpture that he sent as a gift to Cardinal Neri Corsini in Rome at about the same time (WINTER 2003, p. 67). Some time later, there is another reference to a portrait of the empress in the copious corrispondence between Baron Charles von Pfuetschner and Marquis Carlo Ginori; in a letter dated November 19th 1746 Baron Pfuetschner wrote: “…Le portrait de l’Impératrice en porcelaine je le trouve beau et de fort bon gout, l’Empereur et l’Impératrice l’on vu, ils ne croyaient pas que V.E. fut déjà si avancé dans sa fabrique…Le portrait ait attrapé une petite fente dans le blanc de la porcelaine, heureusement qu’elle ne touche pas au portrait”. In another letter dated December 24th 1746, the baron informed Ginori of the high customs duty he had had to pay for the portrait: “…pour le portrait de S.ML’Impératrice en porcelaine que V:E m’a envoyé, on m’a fait payer presque 3 fl.de douane” (D’AGLIANO 2008, p. 97-98). These documents demonstrate that there were two portraits of the empress sent from Florence, one in 1744 and another in 1746. For the first portrait we do not have any details that would be useful to identify it, but for the second, the baron states that the plaque had a tiny crack, “fortunately only in the white part of the porcelain”, so that we imagine that it must have been painted in colours. At Doccia they must have made at least one other painted plaque together with another celebratory plaque in white porcelain because in the lists that were made after the death of Carlo Ginori on July 7th 1757 it mentions: “…a small square white plaque with the empress decorated with garlands of flowers, and painted but cracked” (D’AGLIANO 2008, p. 100). The plaque in the V&A also has cracks around the edge of the portrait. The excellent pictorial quality of the plaque with the delicate brush strokes of the red drapery which give it a three-dimensional appearance, and the decoration of the lower part of the gold band in which there is a mask that appears barely visible, suggest that it was made in the period that corresponds to the letters dated 1744 and 1746, which was the last year at Doccia of the painter Carl Wendelin Anreiter who had been teaching the young apprentices at the factory since 1737 (GINORI LISCI 1963, p. 25). A version in white porcelain with a frame surmounted by the imperial crown is in the Museo di Doccia (LIVERANI 1967, p. 63, plate IV). Another plaque in white porcelain was recorded by Leonardo Ginori Lisci in the collection of the Prince of Yugoslavia, formerly the Demidoff collection in the Villa of Pratolino near Florence (GINORI LISCI 1963, p. 131, nota 20), now lost. A plaque with a portrait of the Empress Maria Theresa in her old age datable to the years 1765-1770 recently appeared on the art market (Sotheby’s, THE COLLECTION OF GIOVANNI AND GABRIELLA BARILLA, Londra, 14 marzo 2012, lot 243). Two more medallions with the imperial couple, Maria Theresa of Austria and Francis Stephen of Lorraine, were made around 1744: an unglazed version is in the Museo di Doccia and a glazed version is in the Museo Duca di Martina in Naples (WINTER 2003, p. 103, 105).The portrait of Maria Theresa of Austria is the same as this plaque. There is a smaller version of the Hapsburg-Lorraine couple on a blue background in the “Tempietto” in Cortona (1751-1757), which Mercury holds in his left hand (WINTER 2003, p. 91). At this time we do not have enough evidence to state with certainty that the plaque in the Victoria &Albert Museum is one of the two sent to Vienna in 1744 or 1746; only research on its provenance before arriving at the Victoria & Albert Museum can ascertain its identity. The plaque was sold to the museum in 1932 for £ 12.10 (together with a Capodimonte vase, £75, inv. C.33-1932). The plaque was originally registered as Capodimonte (concerning the mistaken attributions of Doccia porcelain to Capodimonte in English collections, see MARITANO 2012, p. 14-17). The shape of the frame around the medallion was used with several variations at Doccia for bedside holy water stoups around 1745-1750 (as shown in an example that recently appeared on the antique market), the model for which can be attributed to Massimiliano Soldani Benzi (I wish to thank Rita Balleri for this information).